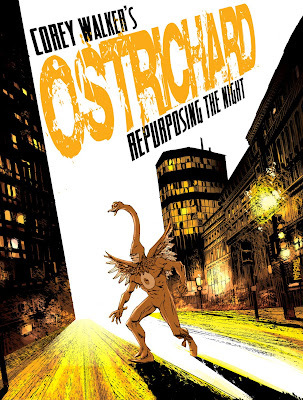 Corey Walker's IP, Ostrichard, has affected my mind so deeply that I've devoted Saturday evenings and Sunday mornings to illustrating my own Ostrichard story. Since April 8th, 2010, I've completed over 25 pages. The story I've proposed is approximately 112 pages [ give or take one or two pages ]. When I've reached around page 80, I plan on presenting my work to Corey for his approval [ perhaps over dinner. I'm thinking Italian. Maybe Chinese. ]. Anyway, this is just one of the three covers I've drawn so far. I know I have a few more in me, but I'm scared to death to show him. That is so awesome. I love this character. Where can I pre-order this? Do you need Kickstarter monies?! MAKE IT HAPPEN, URBANBARBARIAN (if that is your real name)!